James Figg was born in Thame in February 1684, the youngest of seven children born to Francis and Elizabeth Figg whom popular opinion believe lived in a row of cottages in Priestend. Being from a poor family in an agricultural town, his early life would not have been easy. He appears to have gained himself a reputation at prize fighting and is known to have frequented the booths at local fairs. He made his headquarters at the Greyhound Inn in Cornmarket, Thame. However to earn a living as a prize-fighter he would have had to venture far away from Thame.During Southwark Fair he used to keep a great tiled booth on the bowling green where he entertained from noon to night. By 1719 he was claiming to be the Champion of England and challenging all comers. Regular Prize Fights were held at a venue called the Boarded House in the Bear Garden in Marylebone Fields off Oxford Street in London. When Figg announced the opening of his theatre he became the first person to openly advertise the teaching of boxing and exhibitions of skill. The curious thing about Figg was that he was more expert as a cudgeller than as a Pugilist, being a master of the sword and expert fencer. It was Figg who made the sport popular and many other amphitheatres - to use the correct term – were to open after his where wooden rails, rather than ropes, formed the ring which was raised up on a stage with the ref safely conducting the proceedings from outside the ring. Figgs business card was designed by his good friend Hogarth and was distributed amongst the crowds and was the first form of advertisement used to promote the then new sport of boxing. "Here I am Jemmy Figg from Thame, I will fight any man in England". That was the cry heard around the Marylebone area of London in the early 18th Century where James Figg opened an academy of arms, including boxing. Christopher Clarkson (the Lancashire soldier), Philip McDonald (the Dublin carpenter), William Finn of Ireland, James Stokes Citizen of London, Rowland Bennet from Ireland. Not only were there men fighting at the Boarded House but often women were advertised and many animals would be baited to fight each other. A host of other fighters were on the supporting bills to these fights and James Figg gained a reputation as a tutor and trainer. He formed his school probably near to his house on Oxford Street. Figg's Amphitheatre or Great House was the prototype of several other schools of pugilism that were developed in this area of London. This Great House stood at the corner of Castle Street and Marylebone Fields and just north of Figg's house at the Sign of the City of Oxford in Oxford Road. These streets still exist although they are now known as Eastcastle Street, Wells Street and Oxford Street. It may be assumed that Figg was also a victualer and supplemented his income as a publican with income from his school where he instructed the nobility in the noble arts. It is claimed that Figg had over 270 fights and only one defeat. That was to Edward Sutton of Gravesend when he was ill. He won the re-match and then came the third and deciding bout with Mr Sutton which was recorded in verse by James Byrom the diarist who wrote in the Spectator. And so sent to challenge the champion of Thame. There hardly was room left to thrust in your skull. All the company cry'd, come the masters, the masters. Shook hands, and to't, and the word it was bilboe. Were peeping there through, to do justice between 'em. His head from his shoulders had been quite discarded. The weapons were frighted, but as for the men,. In truth they ne'er- minded, but at it again. Without ever stirring an inch either way. If his own broken sword had not given the wound. With danger so little, with honor so much! But made up, like Figg's, of the common red liquor. They took to their wood, and i' faith never sham'd it. Would have made any fibres, but Figg's, to have smarted. That Figg should hit Sutton a stroke on the knee. And thus the great Figg became lord of the field. Boxing became a popular sport in the early part of the 18th century with the acknowledgement of James Figg as the first heavyweight king of Britain in 1719 and to many the story of the heavyweights is the story of boxing itself When Figg announced the opening of his theatre he became the first person to openly advertise the teaching of boxing and exhibitions of skill. The curious thing about Figg was that he was more expert as a cudgeller than as a Pugilist, being a master of the sword and expert fencer. 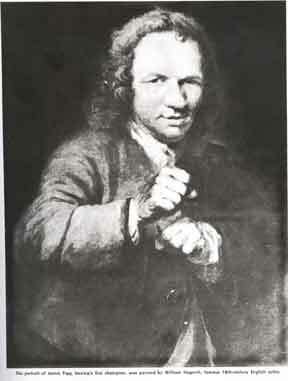 Figg resigned his title in 1734 and died in 1740 and his pupil George Taylor claimed the title which he retained until 1740 when he was beaten by Jack Broughton ,the father of boxing rules and inventor of the boxing glove, in 1740 in front of a large crowd at one of Taylor’s own boxing booths. The gloves (mufflers) at that time were only used in sparring exhibitions. He devised the mufflers for use of his pupils, many from the aristocratic families of the day, to lessen the risk of facial damage during lessons at his private school. Presumable the lords and ladies of the day were non to keen on having Sunday lunch looking across the table at there little offspring with a face cut to bits and resembling a bag of spanners. The Broughton rules – seven short paragraphs – barred gouging and hitting a fallen opponent but a wide latitude was still there for wrestling and rough and tumble fighting – which to be sure was taken full advantage of. Broughton lived to the age of 85, amazing when one considers his life style, and was buried with the British elite in Westminster abbey. His friendship with the Duke of Cumberland helped. Previously boxing had been a toe to toe affair but Broughton, who studied defence and attack, introduced stopping, blocking, hitting and retreating. His rules were to govern boxing from 1743 to 1838 when the new code of “The London Prize Ring Rules” was adopted. Broughton had been a well-respected man and after his retirement from the scene and any notions that the honesty for which he was known was to continue was soon to vanish when Jack Slack came on the scene.